Gaining control of your sleep can help with stress. 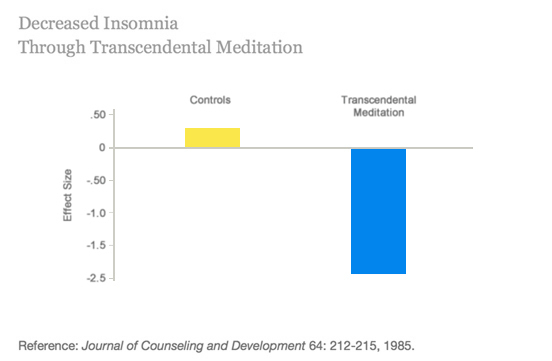 By learning Transcendental Meditation (TM) you take the first step to reducing stress levels and improving your sleep. Women experience anxiety at about twice the rate of men. Not fair, but that is what the data shows. The National Sleep Foundation recommends that adults 18–64 years need 7–9 hours. Sleep is a key pillar of health. Add TM to your routine for better sleep. 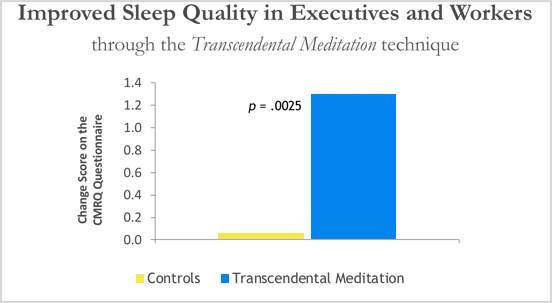 A study of executives and workers in the automotive industry revealed that after 3 months of regular practice of the TM program, participants showed improved sleep quality in comparison to controls from the same work sites. Is your work causing your insomnia? Although opinions vary as to the causes of insomnia, work anxiety is the factor most frequently identified as the cause. Scientific research indicates that TM is effective in dissipating anxiety; therefore, one might expect this program to naturally alleviate insomnia. You pick a way you want to improve your sleep. Keep track of your habits. This can be done with an app or by journaling. How much sleep do you want to get? 1You pick a way you want to improve your sleep. A pre-bedtime activity is something that you do within the two-hour window before going to sleep. Consider removing the following five activities from your routine close to bedtime to minimize negative sleep quality. Check the temperature, the mattress, the noise to create a peaceful atmosphere. Practising Transcendental Meditation 2x a day allows your mind to effortlessly relax which helps you go to sleep. Plan for an eight- hour sleep by making sleep a priority. Develop a regular schedule to perform prior to going to sleep. Keeping a consistent bedtime and wake time leads to better sleep quality. Continue to maintain healthy sleeping habits. 2Keep track of your habits. This can be done with an app or by journaling. a.Did you add pre-bed activities? b.Did you do your TM today? c.Were you in bed for at least 7 hours? d.Did you hit your bedtime and wake time? 3How much sleep do you want to get? add 30 more minutes of sleep to your night at a time and build it from there. Curious to understand how sleep impacts your health? Sleeping for just one hour will make you feel groggy, unfocused, distracted, forgetful. You’ll suffer headaches, irrational anger, and micro-sleeps (where you fall asleep for a few seconds without noticing). Sleeping for only a short period of time is common among people who have insomnia. Insomnia is getting less sleep than your body needs. Sleep is important for memory, decision-making, reaction time and alertness. Driving can be hazardous if you have trouble sleeping. Are your emotions heightened? Do you feel tired? Not getting enough sleep can weaken your immune system, impact your learning and memory, diabetes, lead to weight gain and acne. Sweet Spot—You have great sleep habits and enjoy the benefits. Great sleep relieves the stress accumulated during the day, allows you to be productive, energized and clear-headed. Oversleeping or sleeping too much also has some risks. Oversleeping usually isn’t about needing more sleep—it’s usually about being exhausted because of some other physical, mental, emotional, or spiritual deficit. Too much sleep on a regular basis has been linked with higher rates of mortality and disease as well as things like depression and mood disorders. Too much is defined as greater than nine hours.